Inability to cope with goals and responsibilities often leads to stress. Stresses in day-to-day life can be seen in neurological and physiological reactions when adapting to new conditions. Personal and environmental events which induce stress are called as stressors,,. Numerous stressors can impact the well-being of students in medical school. Apart from coping with day-to-day stressors, medical students should deal with stressors specific to medical school in terms of the heavy curriculum which should be covered within a stipulated duration, long working hours, lack of recreation, separation from family, financial concerns, and competition with peers. High levels of stress can have negative impacts on the cognition and comprehension of medical students. They can suppress and inhibit learning and in turn affect academic performance. Studies worldwide have reported a prevalence of stress among medical students from 27% to 73%. This stress could lead to anxiety, depression,, suicidal thoughts, interpersonal conflicts, sleep disturbances, poor academic and clinical performance, and alcohol and substance abuse. The right amount of stress can be a helpful, positive force. However, too much stress can lead to tension and anxiety and can cause sleep problems. First-year medical students begin their careers unaware and unprepared to cope with the challenges of the profession. If high levels of unwanted stress are not properly managed, their health and sense of well-being can suffer. Hence, there is a need to create a compassionate and stress-free competitive environment within the campus to avoid consequences such as depression, sleep problems, tension, anxiety, work mistakes, poor concentration, and apathy. The extent of perceived stress, its association with sleep quality, and the attributed stressors among 1st-year medical students were explored in this study. The aim of the study is to assess the perceived stress among 1st-year medical students using the Perceived Stress Scale-14 (PSS-14) and its association with sleep quality as assessed using the Pittsburg sleep quality index and the attributed stressors. A cross-sectional study was conducted of 1st-year medical students. The study was reviewed and approved by the Institution Ethics Committee (KAIMS/IEC/20/2016). The study included all new medical students. Of 150 students in the study population, the sample size required was 108 with a confidence interval of 95% and a margin of error of 5.0%. The study was done in December 2016. This period was chosen because the students had entered the professional course 2–3 months earlier on September 1, 2016. During this time, the students were not only exposed to various academic stressors but also psychosocial and health-related stressors. This study was conducted in Karwar Institute of Medical Sciences, Karwar, Karnataka, India. The intention of the study was explained to the students and they were assured that their identity would not be disclosed. Participants who volunteered and gave informed written consent were included in the study. Of 150 1st-year medical students, 121 volunteered and gave consent to participate (response rate – 80.67%). Six of the volunteer participants were day-scholars and the remaining 115 participants stayed in the student hostel. The sociodemographic profile of the participants was recorded. The extent of perceived stress was assessed using the PSS-14. 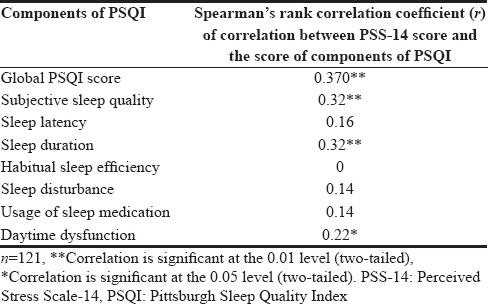 Sleep quality was assessed using the Pittsburgh Sleep Quality Index (PSQI). Grading of stress exerted by the attributed stressors was also assessed. Attributed stressors were compiled based on previous studies. All participants assembled in a lecture hall on December 21, 2016, in the morning. The questionnaires consisting of a sociodemographic profile, the PSS-14, the PSQI, and a list of potential stressors graded with a Likert scale were distributed to the participants. The contents were explained initially by one of the authors. Questions were addressed individually by the other authors. Adequate time was given to complete the questionnaires. The students were asked not to discuss the contents among themselves and were asked to mark the questionnaires appropriately. The PSS-14 is a self-rated questionnaire to measure perceived stress, consisting of 7 positively stated and 7 negatively stated items. The negatively stated items are reverse scored and then summed with the scores of the positively stated items to get the total score for perceived stress. The scores range from 0 to 56, with higher scores indicating higher levels of stress. This scale has an internal consistency score of Cronbach's α 0.85 with a test–retest reliability of 0.85 after 1 week. The PSS-14 scores were divided into stratified quartiles. The upper two and lower two quartiles were combined, with 28 being the operational cutoff value for stressed and not stressed conditions. This cutoff value was selected in accordance to with an earlier study. In this study, the test–retest reliability of the PSS-14 was 0.84. The PSQI is a self-rated questionnaire consisting of 19 questions used to assess 7 components of sleep – subjective sleep quality, sleep latency, sleep duration, habitual sleep efficiency, sleep disturbance, usage of sleep medication, and daytime dysfunction during the previous month. Each question on the questionnaire is scored from 0 to 3, with 0 being the highest and 3 being the lowest score. The seven component scores are then added to get a global PSQI score in the range of 0–21. A global score ≥5 indicates poor sleep quality in the past month. The PSQI is reliable with a Cronbach's α of 0.83. In this study, the PSQI had an internal consistency of 0.82. Potential stressors were compiled based on earlier studies done by Shah et al. and Sreeramareddy et al.,. A total of 29 stressors were included in the list. They were categorized into academic, psychosocial, and health-related stressors as opined by the psychiatrist and psychologist. The severity of stress for each stressor was scored ranging from 1 to 5 on a Likert scale. The scoring of these stressors had an internal consistency of 0.85 after 1 week in this study. The data were compiled in Microsoft Excel and analyzed with appropriate statistical tests using Microsoft Excel 2010 (provided by Microsoft) and SPSS 11 software (provided by SPSS Inc., Chicago, Illinois, USA) Student's unpaired t-test was applied for comparison between subgroups. 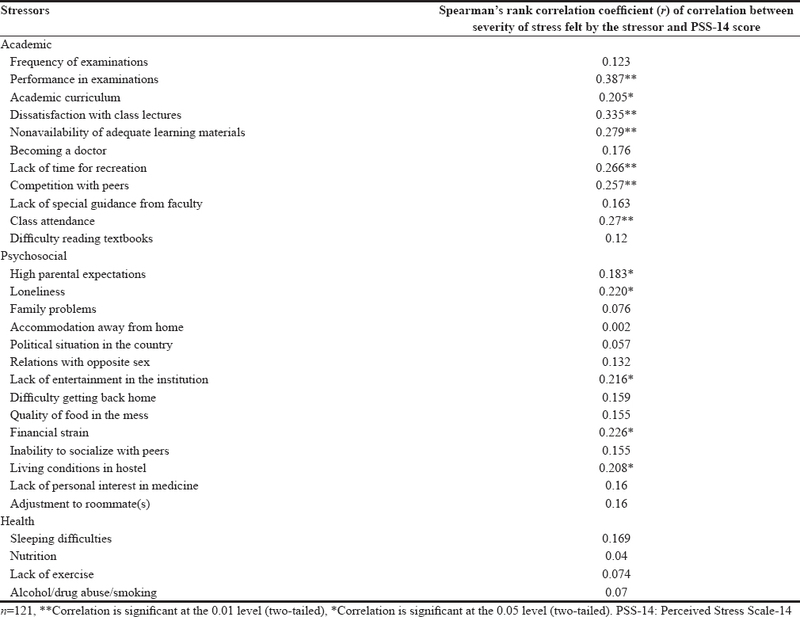 Spearman's rank correlation test was applied for correlation between stressors and the PSS-14 score and between the PSS-14 and PSQI scores. A total of 69 participants were included in the study of which 17 were men and 52 were women. They were 18.37 ± 0.8 years old with ages ranging from 17 to 19 years. The PSS-14 scores are noted in [Table 1]. The mean PSS-14 score was 26.55 ± 5.4. A total of 33.8% had PSS-14 scores >28. Although the prevalence of PSS-14 scores >28 and the mean PSS-14 score were higher in men, the gender difference was statistically insignificant. The severity of stress felt from various stressors is noted in [Table 2]. The highest rated academic stressors were performance in examinations (34.7%), lack of time for recreation (30.6%), curriculum (24.8%), and frequency of examinations (24.8%). The highest rated psychosocial stressors were quality of food in the mess (50.4%) and lack of entertainment in the institution (39.7%). In the subgroup with PSS-14 scores ≤28, frequency of examinations (25%), performance in examinations (25%), and lack of time for recreation (23.8%) were the highest rated academic stressors; quality of food in the mess (46.3) and lack of entertainment in the institution (31.3%) were the highest rated psychosocial stressors. In the subgroup with PSS-14 score >28, performance in examinations (53.7%), lack of time for recreation (43.9%), curriculum (36.6%), lack of special guidance from faculty (31.7%), competition with peers (29.3%), and frequency of examinations (24.4%) were the higher rated academic stressors; dissatisfaction with class lectures (29.3%); quality of food in the mess (58.5%), lack of entertainment in the institution (56.1%), difficulty in getting back home (34.1%), and high parental expectations (24.4%) were the highest rated psychosocial stressors; nutrition (26.8%) and lack of exercise (24.4%) were the highest rated health-related stressors. Correlations between the severity of stress felt by various stressors and PSS-14 scores among participants are noted in [Table 3]. There were positive correlations between the PSS-14 score and various potential academic, psychosocial, and health-related stressors, including performance in examinations, dissatisfaction with class lectures, nonavailability of adequate learning materials, lack of time for recreation, competition with peers, academic curriculum, financial strain, loneliness, lack of entertainment in the institution, living conditions in the hostel, high parental expectations, and class attendance. Correlations between the PSS-14 score and the scores of components of the PSQI are noted in [Table 4]. There were positive correlations between perceived stress and the global PSQI score and the components of the PSQI, including subjective sleep quality, sleep duration, and daytime dysfunction. [Table 5] shows a significant difference in the mean global PSQI score between subgroups based on the PSS-14 score. Medical students undergo lot of stress in academics due to the huge curriculum and adjustments to the new environment at college. Various studies have reported stress among medical students at different phases of the medical course and during internships. The present study aimed to determine the extent of stress perceived among 1st-year medical students a few months after starting the course. Brahmbhatt et al. reported that prevalence of stress among medical students ranged from 27% to 73%. Wide variations in prevalence are due to different stress tools being applied and also the environment of the medical student. A total of 33.8% of the medical students had a PSS-14 score >28 in this study. The prevalence rate is low compared to other studies reporting perceived stress in India. This is due to lack of standard stratification of the perceived stress score. In earlier studies, perceived stress scores were divided into three categories. In this study, four categories were used, with scores in the upper two quartiles considered as stressed. Some previous studies noted significant gender differences in perceived stress,, while some did not,,. There was no gender difference in this study although men seemed to be more susceptible to stress from various stressors. A heavy curriculum, lack of time for recreation, frequency of examinations, performance in examinations, lack of entertainment in the institution, and quality of food in the mess were common academic and psychosocial stressors in the study group. Earlier studies have also noted these as stressors among medical students,,,. Students with higher perceived stress felt a lack of special guidance from faculty, dissatisfaction with class lectures, competition with peers, difficulty in getting back home, high parental expectations, nutrition problems, and lack of exercise as common academic psychosocial and health-related stressors, similar to previous studies,,. Special care is required for these students at the earliest possible time. Teacher–student mentorship could help identify students with higher perceived stress and provide them with counseling to cope with stress. The first phase of the medical course curriculum lasts 1 year. When there is a reduction in the duration from 1½ years to 1 year, the same curriculum should be covered in 9–10 months, with a corresponding increase in lecture class content. This affects the learning process, leading to dissatisfaction with class lectures. With the difficulty in coping with changes in living conditions, students feel that they have to visit their hometown frequently. However, with the increased distance from home, students feel stressed in getting back to their homes. They miss classes and feel the burden of making up for missed classes. Students feel a lack of time for extracurricular activities which psychologically affects them. Significant positive correlation between perceived stress by the students and the various attributed academic, psychosocial, and health-related stressors was noted in this study as in earlier studies,. The quality of sleep was also affected by the increase in perceived stress with significant deterioration of sleep quality in the subgroup with higher perceived stress. There was a significant positive correlation between perceived stress and the global PSQI score (r = 0.39). There was an insignificant correlation between sleeping difficulties and perceived stress. The students had no problem falling asleep soon after getting into bed, as measured by sleep latency. The other components of sleep quality, such as sleep duration, daytime dysfunction, and disturbed sleep, were affected, leading to significant association between perceived stress and sleep quality. Keeping pace with lecture classes, fear of failure, and frequency of and performance in examinations could have reduced their sleep duration. This led to daytime dysfunction affecting the learning process. A similar correlation was noted in a previous study. Complications of stress such as depression, anxiety, and suicidal tendencies are on the rise. Early intervention for perceived stress will help in improving the general condition of medical students. Providing a stress-free environment could improve academic performance, reduce professional mistakes, and prevent the consequences of stress. In this regard, the Medical Council of India is suggesting reform in the curriculum wherein the 1st year of the medical course will be extended to 14 months. Changes in the method of assessment of academic performance, both in formative and summative assessments, are highly required for uniform assessment of all students. New medical students are exposed to various stressors, consisting mostly of academic and psychosocial stressors. Stress, in turn, affects sleep quality. Deterioration in sleep quality affects general health. Hence, there is a need to address these stressors by student counseling, modifications in the teaching and evaluation systems, improving the living conditions of students, making them feel at home, and encouraging them to get involved in extracurricular activities such as sports and exercise, meditation, yoga, and music. The study intended to note the various stressors and the perceived stress affecting sleep quality among 1st-year medical students. The study was done in one medical college. Hence, the sample size was small, limiting generalization of the results. The reasons why nonresponders did not participate were not assessed. Along with academic stressors, there were various psychosocial and health-related stressors which cause perceived stress among 1st-year medical students. A prospective study regarding the persistence of stressors for students and their effect on academic performance is required to make conclusions. A similar assessment is required in other colleges to compare and generalize the results to pave the way for reforms in the curriculum. The authors thank the participants of this study and the Department Head and staff members of Physiology Department, Karwar Institute of Medical Sciences, Karwar, Karnataka, for their kind support and encouragement. Siraj HH, Salam A, Roslan R, Hasan NA, Jin TH, Othman MN. Stress and its association with the academic performance of undergraduate fourth year medical students at Universiti Kebangsaan Malaysia. IMJM 2014;13:1-6. Yusoff MS, Abdul Rahim AF, Yaacob MJ. Prevalence and sources of stress among Universiti Sains Malaysia medical students. Malays J Med Sci 2010;17:30-7. Myers DG. Stress and health. Exploring psychology. 6th ed. New York: Worth Publishers; 2005, p. 402. El-Masry R, Ghreiz SM, Shams TM, Helal RM. Perceived stress and burnout among medical students during clinical period. Ibnosina J Med BS 2012;5:179-88. Brahmbhatt KR, Nadeera VP, Prasanna KS, Jayram S. Perceived stress and sources of stress among medical undergraduates in a private Medical College in Mangalore, India. IJBAR 2013;4:128-36. Shariati M, Yunesian M, Vash JH. Mental health of medical students: A cross-sectional study in Tehran. Psychol Rep 2007;100:346-54. Alem A, Araya M, Melaku Z, Wendimagegn D, Abdulahi A. Mental distress in medical students of Addis Ababa university. Ethiop Med J 2005;43:159-66. Baldwin DC Jr., Daugherty SR, Eckenfels EJ. Student perceptions of mistreatment and harassment during medical school. A survey of ten United States schools. West J Med 1991;155:140-5. Niemi PM, Vainiomäki PT. Medical students' distress-quality, continuity and gender differences during a six-year medical programme. Med Teach 2006;28:136-41. Firth-Cozens J. Emotional distress in junior house officers. Br Med J (Clin Res Ed) 1987;295:533-6. Ball S, Bax A. Self-care in medical education: Effectiveness of health-habits interventions for first-year medical students. Acad Med 2002;77:911-7. Sreeramareddy CT, Shankar PR, Binu VS, Mukhopadhyay C, Ray B, Menezes RG, et al. Psychological morbidity, sources of stress and coping strategies among undergraduate medical students of Nepal. BMC Med Educ 2007;7:26. Sani M, Mahfouz MS, Bani I, Alsomily AH, Alagi D, Alsomily NY. Prevalence of stress among medical students in Jizan University, Kingdom of Saudi Arabia. Gulf Med J 2012;1:19-25. Abdel Rahman AG, Al Hashim BN, Al Hiji NK, Al-Abbad Z. Stress among medical Saudi students at college of medicine, King Faisal university. J Prev Med Hyg 2013;54:195-9. Nagajyothi V, Vasundaradevi B, Radhikarani KC, Bharathi U. Study of psychological stress among undergraduate medical students of Sri Venkateshwara Medical College, Tirupathi. IOSR J Dent Med Sci 2015;14:33-6. Shriram V, Bhimani N, Aundhakar N, Zingade U, Kowale A. Study of perceived stress among I MBBS medical students. JETHS 2015;2:8-12. Redwood SK, Pollak MH. Student-led stress management program for first-year medical students. Teach Learn Med 2007;19:42-6. Supe AN. A study of stress in medical students at Seth GS Medical College. J Postgrad Med 1998;44:1-6. Moffat KJ, McConnachie A, Ross S, Morrison JM. First year medical student stress and coping in a problem-based learning medical curriculum. Med Educ 2004;38:482-91. Swaminathan A, Viswanathan S, Gnanadurai T, Ayyavoo S, Manickam T. Perceived stress and sources of stress among first-year medical undergraduate students in a private medical college-Tamil Nadu. Natl J Physiol Pharm Pharmacol 2016;6:9-14. Waqas A, Khan S, Sharif W, Khalid U, Ali A. Association of academic stress with sleeping difficulties in medical students of a Pakistani medical school: A cross sectional survey. PeerJ 2015;3:e840.